To gain a full ‘Directory of services to help improve mental health and emotional wellbeing’, for your given locality please contact your relevant locality based Public Health Agency – Health and Social Well-being Improvement Team (contact information below). Directories highlight the wide range of contacts for practical support and services in your area. 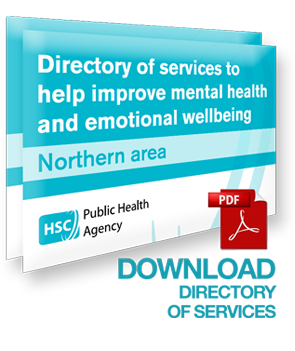 Targeted at individuals and potential referrers the user-friendly resources will raise awareness and provide a comprehensive guide to the wide range of support that can be accessed locally to help improve mental health and emotional well-being. The support available is wide ranging and includes help to cope with issues such as: bereavement support; drugs and alcohol addiction; sexual health; and the concerns of young people or older people, to name but a few.